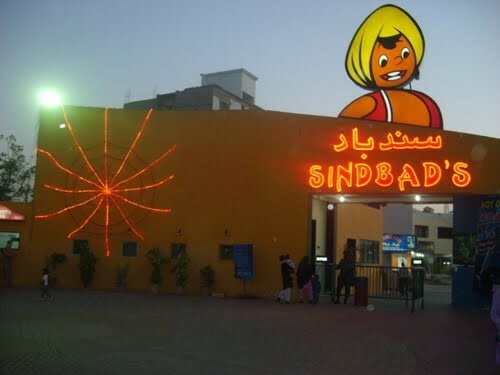 Sindhbad is the most visited and famous Entertainment Places in Karachi, It is located in Gulshan-e-Iqbal Karachi Pakistan. Sinbad’s offers you and your family just that! 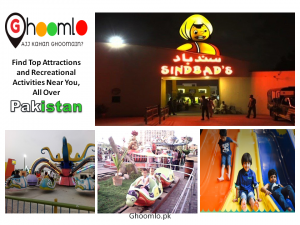 Sindbad’s Wonderland offers endless family entertainment and recreational activity for all age groups at a very competitive price. Situated in the heart of the city, Sindbad’s caters to all the densely populated areas of Karachi with an estimated population of nearly 18 million. Whether you want to celebrate your children’s birthday or have a fun-filled picnic with family and friends, this is the ideal place to be. There are thrilling 4-D movies to watch, hi-tech electronic games to play, joy rides and water slides to enjoy, and much more in very pleasant and secure surroundings. Relax in the green areas with mouth-watering food and snacks from the cafes and snack bars on the premises. It is the ultimate in funtertainment for the whole family. Sinbad caters to corporate clients as well as to individual families. Arrange an office family party and let us make it a special day for your employees and their families – one they will never forget. We also cater to school groups for half-a-day or full-day tours. Sinbad offers different tailor-made packages as per your choice and budget. Let us make it not just enjoyable but affordable as well.